We’d love your help. Let us know what’s wrong with this preview of Born Free by Joy Adamson. "A special edition of Born Free by Joy Adamson reissued with a bright retro design to celebrate Pan’s 70th anniversary. In 1960, Joy Adamson first introduced to the world the story of her life alongside Elsa – the lioness she had rescued as an orphaned cub and raised to adulthood at her home in Kenya. But, as Elsa had been born free, Joy made the heart-breaking decision t "A special edition of Born Free by Joy Adamson reissued with a bright retro design to celebrate Pan’s 70th anniversary. To ask other readers questions about Born Free, please sign up. Am I right in thinking that the edition that I have read by the publishing company Pan covers not only Born Free, but also Living Free and Forever Free also? This volume is a reprint of the three books written by Joy Adamson about Elsa the lioness. The first Born Free is sweet, so terribly sweet that you have to brush your teeth before and after reading, it narrates how her husband shot a lioness (I think actually the wrong one) and how the couple adopted the three cubs, two were eventually air freighted to Rotterdam, they live with the third, Elsa for a while before letting her loose in a part of Kenya decided upon by Adamson's husband, a game ward This volume is a reprint of the three books written by Joy Adamson about Elsa the lioness. The first Born Free is sweet, so terribly sweet that you have to brush your teeth before and after reading, it narrates how her husband shot a lioness (I think actually the wrong one) and how the couple adopted the three cubs, two were eventually air freighted to Rotterdam, they live with the third, Elsa for a while before letting her loose in a part of Kenya decided upon by Adamson's husband, a game warden. This book is full of the playfulness of animals, lions are not for nothing known as big cats it seems and some of their other playful behaviour reminded me of dogs, so reading I had to pause to take laughter and memory breaks to recall similar things done by a house cat and a dog of disreputable character who unlike Elsa did not roll in elephant dung (due to general absence of elephants in English fields and woods) but in fox faeces, her wild delight matched by my deep despair as her fine perfume was for my non-canine nose a malodorous stink that necessitated immediate bathtime (view spoiler)[ and I have not yet seen a sadder sight than the look of tragedy in our dog's eyes as I bathed her (hide spoiler)]. Adamson does not attempt to give Elsa a bath, though she does chase after her while trying to give her an enema at one point. Otherwise Elsa does all the things that domestic cats and dogs do - meow, purr, stalk animals, knock drinks off tables with her tail, get stuck climbing trees, jump up on people she likes, play with sticks, go swimming in the Indian Ocean, and so on with the slight difference that she is a wild animal, big and heavy. This all takes place at the end 1950s, and the book is published in 1960. Elsa is three years old and has finally learnt to kill her own dinner. The next book is Living Free Adamson repeatedly visits the area where Elsa has been released, there are various reunions, Elsa becomes pregnant, gets into fights (you know your typical teenaged mother from a broken home story), gives birth, causes Adamson some panic as lions (as do some other mammals) can retract their teats so they can go about their business as needed and then at leisure lower them to nurse their young, eventually Elsa allows Adamson et al to make acquaintance with her cubs. Adamson receives fan mail from readers of Born Free Their publisher comes out from Britain and is introduced to Elsa, at which point Adamson does not mention raising the question of her royalties(view spoiler)[ but maybe I'm just nastier than her imagining that discussions over the size of an advance would go better when an adult lioness has her head on the publishers knee (hide spoiler)], this part is somewhat less sweet. The final section is Forever Free which is about Elsa's cubs. The area where the Adamson's released Elsa had within her range a number of villages and given that she and her cubs where extensively fed on goat on by the Adamsons there was a certain, ahem, disquiet among the human population and the Adamsons are told they have to relocate the lions somewhere more suitable. At this the author has a burst of temper blaming 'political agitation' - this is still a few years before independence - for this decision, I don't know quite what she is implying, possibly no more than that the black people are being uppity and complaining about her doing as she pleases playing at being Dr Dolittle or Tarzan, the desire not to have a growing population of lions as your neighbours getting into your stockades and eating your goats seems a perfectly understandable one to me, neither of the Adamsons come out of this looking partially well to my mind. Then the story gets into the deeply ridiculous, the Serengeti national park offers to take in the lions - now the subject of two published books - but no soon have the lions been transported there then the Adamsons are informed that they must be moved on to a different part of the national park before the tourist season starts, at the same time the Serengeti seems to be rather crowded with lions, and the Adamson's bunch skedaddle to find somewhere more private, George Adamson is still working elsewhere as a game warden, one of the cubs has an arrow in his rump as a result of helping himself to other people's goats, the Adamsons are roaming around trying to find their lions while requesting permission to camp overnight in the national park, kill animals for the wounded cub to eat, and trying to persuade a vet to operate on the cub that they can't find, while shooing (view spoiler)[ such was the advise of the wardens there, indeed it all so casual that a tourist ends up getting fatally bitten by a lion, doubly fatal as the lion is executed for the crime of being itself and too wild rather than properly respectful to sleeping tourists (hide spoiler)] away copulating lions who seem to be everywhere and eventually the story peters out in June 1962. Reading the sensation of sweetness was cloying, now looking bad over what I have written (view spoiler)[ remember Orpheus: don't look back! (hide spoiler)] it strikes me instead as a story of arrogance and stupidity (view spoiler)[ not just of the Adamsons, the authorities particularly of the national park look pretty stupid too (hide spoiler)], perhaps more revealing of the Adamson's needs than about lionesses and lions, the couple didn't have children and eventually separated, maybe it is just me, but it is hard not to see the lions, if not directly as child substitutes, than an attempt to cement the relationship around these lions. The amount of effort they put into Elsa's cubs is prodigious. In the end it is all about the Adamsons and their needs, not about the lions. Joy Adamson put me in mind a little of Karen Blixen and Out of Africa and Shadows on the Grass, two non-Britons writing these archetypal books about British Empire Kenya. Blixen though was more of a stylist. Adamson's prose is plain and simple, ideal for young readers or those learning English. Adamson was born Friederike Viktoria Gessner in the Austro-Hungarian Empire (specifically the area of the Czech republic), she proceeded through a series of marriages to end up as Joy Adamson married to a game warden, both she and her husband eventually died violent deaths, Joy's murderer eventually claiming that he killed her over a wage dispute after she shot at him (view spoiler)[see here (hide spoiler)]. Imagine my confusion. All my life I've been able to see Born Free , Living Free and Forever Free on my mum's bookshelf. I know roughly what size they are. This was much longer than I was expecting and although I tried vainly to convince myself that perhaps it was just an effect of reading a digital edition (how accurate are those page numbers, really?) it was a third of the way into the book that the truth was revealed to me: this is not Born Free, it's The Story of Elsa. Perhaps that subti Imagine my confusion. All my life I've been able to see Born Free , Living Free and Forever Free on my mum's bookshelf. I know roughly what size they are. This was much longer than I was expecting and although I tried vainly to convince myself that perhaps it was just an effect of reading a digital edition (how accurate are those page numbers, really?) it was a third of the way into the book that the truth was revealed to me: this is not Born Free, it's The Story of Elsa. Perhaps that subtitle should have made it plain, but it didn't. This seems like terrible re-branding by the publishers - nothing online gave the game away and I notice that several other books matching this description are wrongly catalogued as the first volume, rather than the collected volume, on GoodReads. I've been a fan of Elsa the lioness since I was young. I have seen the movie multiple times, but this is my first experience with the book. I loved it! Altough the movie is nice, the book gives a new perspective to Elsa's life. I loved how detailed it was and there were pictures - that really helped me to get a nice vision. I got seriously attached to Elsa. (view spoiler)[I confess. I cried when she died. I cried again when the author saw her in her son Jespah. And finally - when they never saw t I've been a fan of Elsa the lioness since I was young. I have seen the movie multiple times, but this is my first experience with the book. I loved it! Altough the movie is nice, the book gives a new perspective to Elsa's life. I loved how detailed it was and there were pictures - that really helped me to get a nice vision. I got seriously attached to Elsa. I know that I read this as a child, and of course, I have seen the movie many times, but it is as amazing a story now as it was back in the 1950s and 1960s when it was happening. This is a true story about a couple who hand-raise a lion cub named Elsa and then release into the wild when she becomes an adult. They share a magical once-in-a-lifetime relationship with her and are able to visit her often even after she has become a "wild" lioness capable of injuring or even killing them. Když jsem se jednou dívala na Animal Planet, právě tam běžel pořád o lvech z rezervace, a jak se o ně občas starají strážci - odchytnou je, zjistí biometrické údaje, případné očkování nebo ošetření, a pustí je zpátky. Tenkrát měmina pronesla něco jako: "Proč nenechají ty lvy být?" A přesně tohle jsem si říkala, když jsem četla tuhle knížku. This review has been hidden because it contains spoilers. To view it, click here. Fantastic story, Elsa absolutely captured my heart. However, I have a few issues with the writer's approach to conservation. Over and over, Elsa is treated like a pet: having daily meals provided for her (a result of shooting game on an almost daily basis) , game drives from the top of the Land rover and so on. I was set back the most when a resident crocodile was shot in it's habitat purely because they wanted Elsa to cross the river without fear - a clear indication that their definition of co Fantastic story, Elsa absolutely captured my heart. However, I have a few issues with the writer's approach to conservation. Over and over, Elsa is treated like a pet: having daily meals provided for her (a result of shooting game on an almost daily basis) , game drives from the top of the Land rover and so on. I was set back the most when a resident crocodile was shot in it's habitat purely because they wanted Elsa to cross the river without fear - a clear indication that their definition of conservation was narrow minded. Later in the book, the author is surprised to find out that the cubs were responsible for raiding domestic goat enclosures during the night - I wasn't! The cubs too had been treated as pets and were fed goat meat from a young age. How do you then not expect them to hunt for the same food you have taught them to like? Lastly, it was all together hard for me to forget the fact that the story is based on a mistake that they failed to correct - shooting Elsa's mother. She failed to let go of Elsa once she was independent, and repeated the same mistake with the cubs. I am so torn on this book. This really was the "full story" with no details left out. 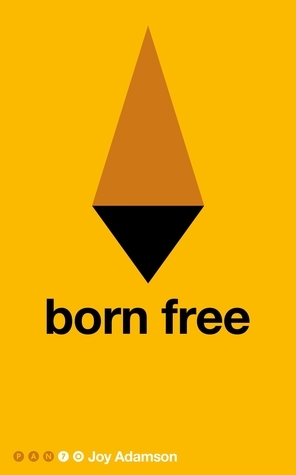 Born Free is such a wonderful story but it was the two follow-up books that rubbed me the wrong way. Joy was no doubt a remarkable woman but her attachment to Elsa past her release prohibited the lioness from teaching her three cubs how to be completely wild. Easier said than done, I understand. The second two books were more like field journals than books. You get every single detail of almost every single day I am so torn on this book. This really was the "full story" with no details left out. First part was great. I think the trouble with real life is you don't get a satisfactory ending! Good book, think they probably did get a bit obsessed, but this is all the better for it. Some hair raising asides, like where an unknown lion went in her tent, but is all shrugged off in their can do and get on with it attitude. A powerfully moving memoir of two very different worlds. A wonderful story telling from Joy Adamson's point of view of how she helped bring up Elsa the lioness, after her mother was shot by George for protecting her cubs (unknown to George at the time). It seems to me that this particular edition covers not only Born Free, but the two following sequels: Living Free (Part Two) and Forever Free (Part Three). I think that this was well written, as Adamson tells the reader of her experiences in bringing up Elsa, having to do the same for Elsa's own cubs (J A wonderful story telling from Joy Adamson's point of view of how she helped bring up Elsa the lioness, after her mother was shot by George for protecting her cubs (unknown to George at the time). It seems to me that this particular edition covers not only Born Free, but the two following sequels: Living Free (Part Two) and Forever Free (Part Three). I think that this was well written, as Adamson tells the reader of her experiences in bringing up Elsa, having to do the same for Elsa's own cubs (Jespah, Gora and Little Elsa) due to Elsa's untimely death, up to their removal and release into the wild in the Serengeti National Park. It also tells of their unsuccessful attempt to find them again. Elsa. I had seen the movie as a child and felt I knew the story already. Reading about Joy and George's efforts to care for, and reeducate, the orphaned Elsa was eye-opening and inspiring. The book reintroduced us to these two complex and committed humans and to a lion with the intelligence to straddle two worlds. Are you surprised this book sat on my bookshelf for many years before getting around to read it? I'm not! This seems to be a recurring theme with me. At any rate, this was an excellent story and an easy read. I shouldn't have waited so long in reading it. The same author has at least two other books I may check in to reading. Born Free is definitely worthwhile reading. Don't wait as long as I have in doing so. I was struck by the part where book talks for a while about the lost habitats of the African wild, and how things are plodding along towards industrialization, and how many fewer animals you see on the plain. That was 50 years ago... I can only speculate how much further we've gone from the ideal since then. Better for reading in chunks (as I did, over many months!) than all in one go. Interesting detail and a fascinating portrait of the time as well as animal behaviour etc.